On Thursday 9 November 1693 Robert Dodsworth stumbled into an alehouse in Bloomsbury with two bleeding wounds—from which he died [FN1]. A Catholic gentleman from Ravensworth, Dodsworth had nevertheless given information to Parliament regarding the supposed Lancashire plot. Attached to his evidence dated 16 May 1690 was a list of those he knew to have received commissions from James II—the notorious "Dodsworth's List" [FN2]. Eight of those allegedly involved in the plot were tried for High Treason in Manchester in October 1694. Without Dodsworth, the most credible witness, these prosecutions failed. The murder was apparently the work of two Jacobite brothers named Deane. 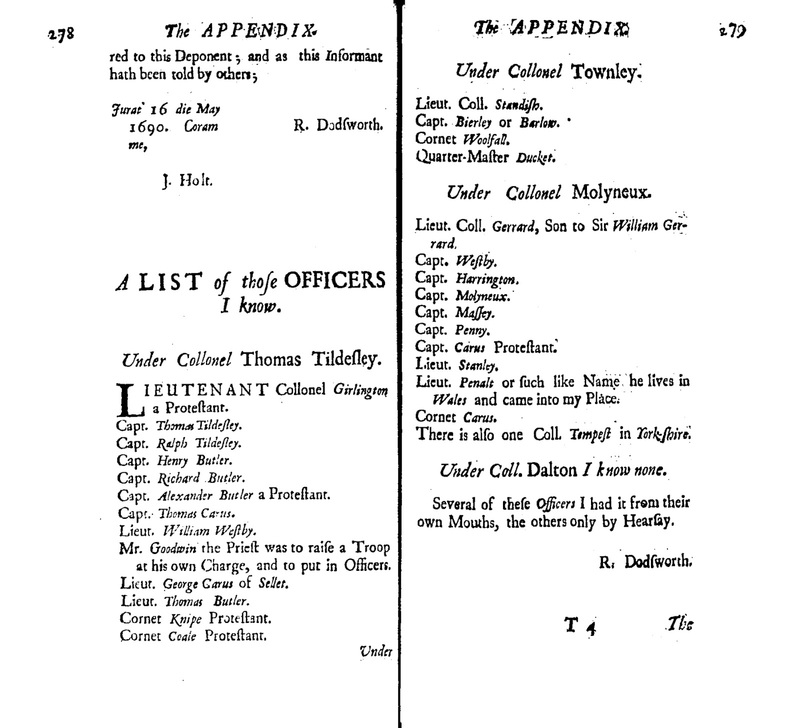 Dodsworth's List contained three members of the Tyldesley family—Colonel Thomas Tyldesley 1657-1715 and his two uncles, Captain Thomas Tyldesley and Captain Ralph Tyldesley. The Tyldesleys were not tried in 1694. A LIST of those OFFICERS I know. LIEUTENANT Collonel Girlington a Protestant. Capt. Alexander Butler a Protestant. 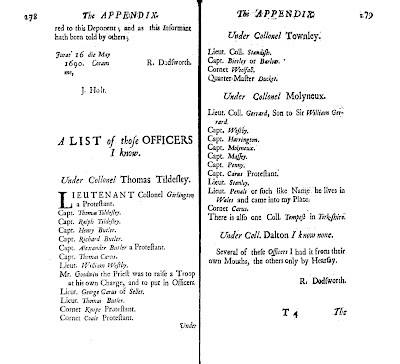 Mr. Goodwin the Priest was to raise a Troop at his own Charge, and to put in Officers. Lieut. George Carus of Sellet. Lieut. Coll. Gerrard, Son to Sir William Gerrard. Lieut. Penalt or such like Name he lives in Wales and came into my Place. There is also one Coll. Tempest in York-shire. Under Coll. Dalton I know none. Several of these Officers I had it from their own Mouths, the others only by Hearsay. 2. A true history of the several designs and conspiracies against His Majesties sacred person and government as they were continually carry'd on from 1688 till 1697, Richard Kingston, 1698.